This post is based on a query that I got in our monthly Q&A session held for our Online Class attendees. A bit more on the Q&A session before we dive in. All our Online Class attendees are invited to a monthly Q&A session, in order to support them in their Power BI journey. Often what you learn in class, you would only apply sometime later. With the Q&A session, if you run into issues or have any questions, you have the opportunity to bring it up and discuss with your instructor. You can sign up for our upcoming Online Live Class on August 3-4. We would clean things up and import the data into separate data and lookup tables. This may seem superfluous for the sample data set, but a real data set could have a lot more rows in the data table and a lot more columns (attributes) for the lookup table. Hence separating the data table and lookup tables is always a good approach. a) Simple Excel Pivot: I dismissed it almost as soon as it crossed my mind. If we simply drag Product and Vendor on rows and columns in a Pivot table, we get a picture but it’s not close to our desired output. I am sure there are ways to do this in Excel, but we need the magic of DAX Measures = “Define Once and Use Everywhere”. Where, we define them once and can use them in any pivot of any shape. And then write another measure find the next minimum quote and so on. But this felt like too much work. What if we had to show the top 10 Vendor quotes and not just top 3? c) TOPN: Whenever I hear “top 3”, “top 10” etc. I gravitate towards the TOPN function. But this didn’t seem right either. TOPN would give me a set of top-ranked items from which I would still be left to determine the 1st, 2nd and 3rd. d) RANKX: Next the RANKX crossed my mind and it felt like a jigsaw puzzle piece slid into place. So on we go with RANKX. Typically, I skip the <order> parameter since the default (descending order) is what I’m looking for. So when determining my top customer, top product, top sales representative etc. the #1 rank would be with the highest value (e.g. the highest Sales). But in this case, the lowest price quote is the best hence should be ranked #1. Therefore I would choose an ascending order (<order> = 1) for RANKX. Attempt #1: Here is my first attempt, and there is a problem right away. All the vendors are getting ranked, even the ones which never submitted a quote for that product. Fine we will suppress the vendors without quotes in attempt #2. Attempt #2: Suppress RANKX where no quotes. Oops! Ranking starts from #21 instead of #1 ?? This isn’t quite right either, since my ranking is not starting from #1, 2, 3 and so on. The Vendors which we just suppressed are still being factored in when RANKX is running; the suppression is after the fact. RANKX is finally looking good! Future Proofing Your Model: I often try to go beyond what is asked of me when building Power Pivot models. I try to think of not just what the customer has asked, but also what they might ask in the future. And I attempt to design my data model to be elegant and flexible enough to be able to answer new questions thrown its way. Over time I expect to tweak things a bit, write few new measures, but the core structure of the data model should remain stable. The only big changes being when we add new data sets – e.g. we start with the Sales data in your data model and then you bring in let’s say your Budget or Service Calls. Back to our problem…In this case even though the user asked only for the top 3 quotes I chose to implement this using a disconnected table. This would allow me to easily extend this to top 5 or even top 10 quotes. We write a harvester measure to get the Selected Rank from our disconnected table, and then a new measure to get the corresponding Vendor Quote (based on SelectedRank). To be able to display the actual Vendor name the first write a helper measure and then our final measure on the same pattern as RankVendorQuote above. 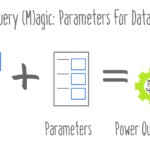 Epilogue: Interestingly the person asking the question was asking me whether they should transform the data table itself using Power Query to get the desired output. This is becoming a very frequent question in our training classes, Q&A sessions and even our consulting work – which tool should I use? Should I use Power Pivot for Power Query for my task? I’ll save that one for my next blog post. Great post, can’t wait to give it a go. The disconnected table has saved me more times than once when doing a comparative analysis on time elements. I’ve set up MAX() equations on the time elements and calculate comparing the value table to the disconnected table. Thoroughly enjoyed following your deep dive into both advanced DAX and advanced design principles. A subtlety I think worth mentioning is the post’s reference to “the suppression is after the fact” could be reversed to say the “inner ranking is done before the outer IF function”. I think this “reversed” perspective is valuable to come to terms with how the formula engine executes at least some (if not many) nested calculations: the formula engine starts from the inside and works outwardly. Often reading complex, “multi-level” formulas from the inside-to-outside has helped me understand them where reading a formula like a sentence or paragraph in English (from left to right, from top to bottom) has not. I was just working on a similar issue yesterday, but my requirement is for data validation. My people would like to see any outlier values in the data set so I am looking to do the reverse. I want to display the highest value, the product, vendor, and date entered. Since my data set has about 1.5M records, I don’t believe the disconnected RankTable is the way to go, unless I am missing something, which would not be a first time. What would be the best way of accomplishing this? Nice post. Can you please share the files as well. Great topic! I’ve struggled with this one in the past. Be careful when using the RANKX function to pick the first, second, third element etc. The reason why has to do with the possibility of ties in the dataset. I fell in this trap myself when I was hired to setup a power pivot model with the aim to analyze voters shifts from leftwing parties to rightwing parties and reverse on a regional basis by the then recent Danish elections. I had a pretty good idea as to how I would solve this (more or less the same way you do in your blog post). So I checked the documentation and saw that the RANKX could rank with more than one criterion and informed my customer that this would be an easy one to pull (not in those words though 😉 ). Not so. RANKX could only rank with one criterion and the polling stations on the small Danish islands had a terrible tendency to tie – two parties in between. It took me some hours and a lot of coffee to figure out how to do it right with 2 TOPN’s and a tiebreak rule. Since the budget wasn’t that big in the first place I wasn’t a particularly happy DAXer. The mistake in the documentation has been corrected now (at least in most places). … could return 2 or more or none vendors, the measure ‘SelectedVendorName’ could return blank in the case of a tie between 2 or more quotes for the same product. Btw: the new DAX function TOPNSKIP() in the next version of DAX (DAX 2016?) will make this problem easy to solve. Good timing on this. Four years almost to the day I originally introduced this issue. http://powerpivotpro.com/2011/07/guest-post-topn-in-powerpivot-v2/. Glad to see that it will soon be fixed. Very good. Could you please share the file as it would make it easier to follow along?